The fastest rate of growth in all areas of development occurs from infancy to twelve months. Our centers have incredible infant programs that provide nurturing environments that are safe, clean, and visually stimulating for infants. We supply each child’s parents with daily reports filled with individualized information about their infant’s day. We feel that a strong partnership with parents is the cornerstone for a lifetime of learning. 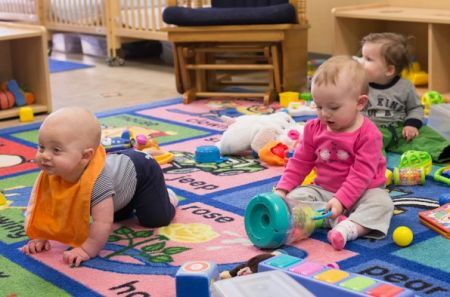 The Creative Curriculum® promotes developmentally appropriate activities that encourage the infants in our care to become confident explorers. Children’s World is Greenville’s premier 5-star child care organization. To learn more about our programs and curriculums, or to tour one of our four Greenville campuses, contact us today.